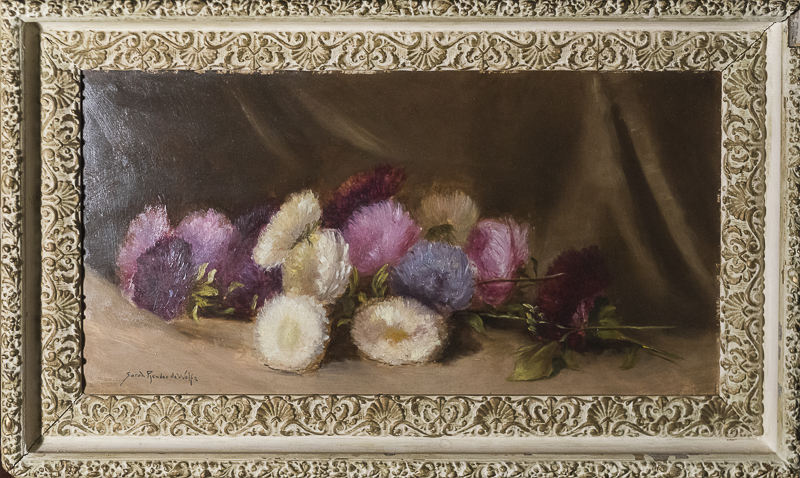 Sarah Bender De Wolfe (1852-1935) Still life with strawflowers o/b 10 x 18″ framed p.o.r. The earthquake and fire of 1906 destroyed her studio at 509 Sacramento Street taking with it many of her early works. She later had a studio on Hyde Street and a home at 3400 Laguna Street where she died on June 15, 1935. Her oils of fruit and flowers qualify her as one of California’s finest still-life specialists. Member: SFAA; SF Women Artists. Exh: Mechanics’ Inst., 1883-97; Calif. State Fair, 1883, 1902; Calif. Midwinter Int’l Expo, 1894; SF Guild of Arts & Crafts, 1904; Sorosis Club, 1913. Collection: Oakland Museum. & CSL; AAA 1909; Ber; AAW; DR; SF Chronicle, 2-19-1904 & 1-3-1905 & 6-17-1935 (obit).